Lydia Martin is having a vision of walking through the river where Theo Raeken's sister died. Valack asks her to describe where she is and what she sees. She moves toward the bridge, and he asks her what Theo did. Outside the vision, Valack dabs at the blood from the hole he drilled in Lydia's head. "What did you do to me?" she asks. "I've amplified your abilities. Something that might just save the lives of your friends." Valack tells her to focus on seeing Theo and why he let his sister die. She goes back into the vision and sees the girl's body come from the river. Her heart is missing. Valack grabs Theo's medical chart. He realizes that if he got a heart transplant, then Theo would be a genetic chimera like the other victims. The hypothermic conditions of her death would keep the organ viable. We see the The Dread Doctors performing the transplant on young Theo. Valack wants to know why they chose Theo. Lydia asks him why he cares. "Because Theo was the first step in the right direction." The Dread Doctors have done everything in pursuit of creating the perfect killer. "And now they've done it." Lydia tells him that Theo doesn't know who the success is. Valack replies that Theo will still lead them in the right direction, because there's a reason that Theo wasn't the answer they were looking for, a reason they changed their methods, and a reason they finally succeeded. Outside Eichen House, Theo's pack arrives. Tracy Stewart takes out a security guard. Josh Diaz takes out another, unphased by his electrified baton. They all enter the building. 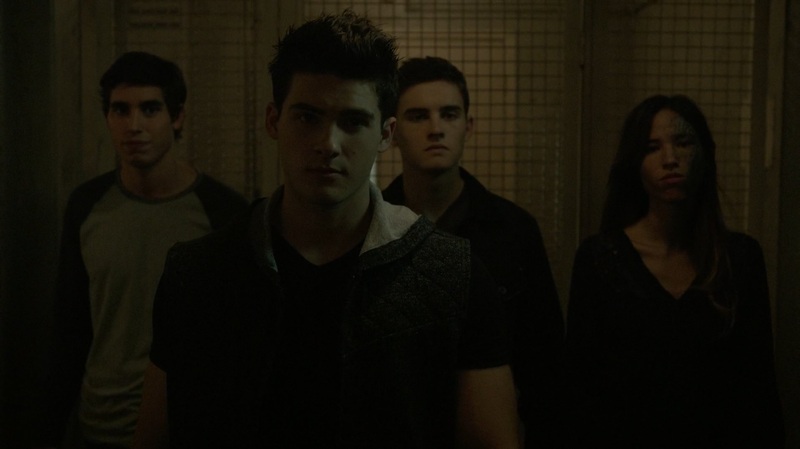 Theo tells the orderly, "We're here for Lydia Martin." Valack continues to question Lydia. He asks her when they were sure that the Dread Doctors had succeeded. She tells him that Scott McCall and Stiles Stilinski found out the night of the Super Moon because the high school sign was in the middle of the school. They just didn't really figure out that that's what it meant. Liam Dunbar had almost killed Scott. Kira Yukimura was still gone. Malia Tate was busy trying to find The Desert Wolf. Lydia herself was missing. And Sheriff Stilinski was dying. Dr. Geyer, Liam's stepdad, is handling the case as Sheriff Stilinski is rolled into the ER with a liver laceration and a perforated intestine. The Sheriff pulls off his oxygen mask to ask where Stiles is. Meanwhile Stiles is at the front desk dealing with a nurse. She's asking him for insurance information. He gets testy with her, telling her that his dad is the sheriff of the county so he better have health insurance. Melissa McCall appears and tells them both that she'll take care of things. She informs Stiles that she texted Scott, who should be coming as soon as he can. She offeres to call Malia, but Stiles tells her not to call anyone. The nurse asks if there's any next of kin to notify, but Stiles is it. Back at his home, Scott drops a bloody washcloth into the sink. His stomach is still a mess of open wounds. Scott grips the sink hard and tries to get angry enough to shift, but all he manages is to make his eyes glow red. He shouts and beats his hand on the sink, not even strong enough to break it. He grabs some gauze to cover his wounds and gets ready to leave, but in the hallway, he gets suddenly dizzy and unable to walk. He stumbles from side to side and then collapses. In the hospital, Stiles is sitting in the waiting area, crying. Parrish is taking a shower after his last hellhound episode. At first he's alone, but then he feels Lydia touching his face. He turns around to kiss her. After he does, he looks at her hand, with one bloody nail. And then down at their feet, where mud and leaves are running off them. "What's happening?" he asks her. "You're a harbinger of death, Jordan. Don't you know?" "Know what?" "Someone's dying." A car horn jerks Jordan out of his dream and he realizes that he's driving. He calls the station to report that Lydia is missing. Hayden Romero's sister Deputy Valerie Clark replies, "Parrish, you're missing." And then she looks at the jail cell that he busted out of. She tells him that they're all really confused by his behavior. He promises to explain it but he needs her help. She tells him that he has no idea what's going on. The high school sign ended up in a hallway. The library is wrecked. There might be a prehistoric animal running around the streets, and she is starting to think about a transfer. Parrish declares that he has to find Lydia. He heads out into the woods to look. He lights a flare, and as he looks around, his eyes glow orange. He heads straight for her. Back at the hospital, Stiles is sleeping. He hears his dad's voice telling him, "Stiles, you need to get up. You gotta get up now." Stiles gasps awake with Melissa kneeling next to him. She tells him that his dad is okay. Stiles wants to see his dad, but Melissa says the anasthesia will take two hours to wear off. She reassures him that his dad is going to be just fine, and Stiles sits back, tearing up with relief. Parrish has brought Lydia to Scott's house and finds Scott lying on the floor. He asks Scott if he's all right. Scott claims to be fine, but Parrish points out that he's bleeding. Scott tells him that it isn't that bad and asks what he needs. Parrish says that he needs help "with her," and shows him Lydia, standing catatonic in the hallway. Parrish explains that he found her out in the woods. Her body was freezing, practically hypothermic. "But that wasn't even the worst part." She had bloodied her nails scraping the star for a sheriff's badge onto a rock. Scott realizes that the badge mark is a warning. The Sheriff's skin has started to change color, and his condition is worsening. At the Sheriff Station, Deputy Clark leaves to go help with any one of the many things wrong in the town, while Liam crouches in the shadows. Liam goes to talk to her, but Mason Hewitt grabs him to stop him. Liam thinks he needs to tell Clark about Hayden, but Mason points out that it doesn't have to be Liam. And it won't be any easier on either of them if it is. They get up, but Liam catches a scent and follows it. It's Hayden's. Liam starts to believe that she's there, but Mason reminds him that he held her dead body in his arms and watched Parrish carry her out of the hospital. Mason tries to convince Liam that Hayden is really gone. But Hayden is there, watching them in the reflection of one of the car windows. She leaves without saying anything. Parrish and Scott rush Lydia into the ER. Parrish puts her on a gurney and reports that she's an 18-year-old female, potentially hypothermic. While Parrish deals with Lydia, Scott heads up to see Stiles. He tries, poorly, to cover the blood stain on his shirt from his leaking wound. When the elevator door opens, he sees Stiles, Dr. Geyer, and Melissa arguing in the hallway. Stiles demands to know what's going on with his father. Two hours ago he looked fine and now his neck is all discolored. "There could have been some minor internal--" "Did you say minor internal? When is anything internal minor?" The adults don't have any answers. "Somebody needs to tell me what's happening to him!" Stiles shouts. Then he sees Scott peering into his dad's room and runs out to tackle him. Stiles throws Scott to the ground. "Where were you? You trusted him. You believed him. Right, huh? So, where were you?" Stiles means Theo. Dr. Geyer and a security guard pull Stiles off Scott. Scott tells him, "You're dad's not the only one who got hurt." "Oh, you'll heal," Stiles bites back. Scott pulls his jacket over his blood stain. "I'm not talking about me." Scott tells Stiles about Lydia. In another room, Natalie Martin strokes Lydia forehead and tells her that everything will be all right. "We're going to get you the best medical care. The best doctors." Stiles comes into the room, and Ms. Martin explodes at him. Stiles says that he thinks he knows who did this, he just needs to look at the back of her neck. She shouts back that she knows who did this. She shoves Stiles out of the room, yelling at him, and slams the door. But she considers his words and does check the back of Lydia's neck, where she finds the claw marks. "I told you to stay in the car," Lydia says. Parrish, Stiles, Melissa, and Scott meet to talk about Lydia. Parrish suggests that it could be shock. "She's catatonic. It was Theo digging his way through her mind," Stiles replies. They don't know what Theo was looking for. Parrish asks what the advantage was of attacking the Sheriff. "It left me alone with Liam," Scott says. Because there would be no one to stop Liam from killing Scott. Parrish thinks they need to find Theo. "Isn't that a little dangerous? Especially since he almost killed my kid?" Melissa adds. Stiles says that Theo didn't want the Sheriff to die. Parrish doesn't understand why Stiles would believe him, and Stiles points out that Theo did tell him where to find his dad. "What do you want to do? Talk to him?" "If it saves my dad, then yeah." Scott tells Stiles that he'll come with him. Theo doesn't know that Scott is still alive, which should give them an advantage. Stiles declines. He just wants to talk to Theo, not fight him. Melissa doesn't think Stiles should go alone. Parrish asks how they'll even find him. Stiles says they don't have to: "He'll come to me." The next morning, Stiles is waiting for Theo at home. He's put a line of mountain ash across the door, but Theo just steps over it. At the hospital, Ms. Martin signs the papers for Lydia to be transferred to Eichen House. It appears to be Dr. Fenris doing the intake. He assures her that Lydia will be safe there. Parrish sees them talking and asks Ms. Martin what she did. "She'll be safe there," she replies. "I did what I had to." Theo looks at the mountain ash. "I guess we're all telling the truth now." Then he looks up the stairway, where Scott is hiding. Stiles takes Scott's shirt and tosses it to Theo. "You killed me best friend?" "Let's be honest, Stiles. Was he still really your best friend?" Stiles evades the question and asks Theo if he's going to let the Sheriff die. "If I wanted him to die I wouldn't have told you where you can find him." Stiles asks why his father's body is shutting down, poisoned by some toxin that they can't find. Theo defends himself, saying that he's a realist, a survivor. "If you knew the things that I know--" "Yeah, but what do you know?" Theo tells him that he knows what's coming and what the Dread Doctors created. He also knows what Parrish is. Liam and Mason are at the hospital, asking Liam's dad about any other bodies that might have been brought in. "No one named Hayden?" Dr. Geyer turns around. "Mason, take him home." When Liam asks again, Dr. Geyer has had enough of their crazy questions and orders them home. Mason is aware by the look on Liam's face that they are not going home. He figures that they actually know where Hayden's body is: at the nemeton. Liam thinks that's a great idea! Mason sighs. "I need to learn to shut up." Theo admits that Lydia figured out what Parrish is and he just dug it out of her memories. He calls her collateral damage. "But if she's right about Parrish, then things around here are going to get a lot worse." Theo tries to impress upon Stiles just how bad it is going to get. Theo turns to leave and Stiles lunges after him, demanding to know what's wrong with his dad. Theo shoves him back into the stairs, where Stiles hits his head and is knocked out. Stiles again hears his father's voice: "Stiles, you need to get up. You gotta get up now". Scott is standing over Stiles, waking him up. Stiles claims that he's okay. He asks if Scott got any readings off Theo. Scott says that Theo was calm the entire time. His heart only jumped once, and it was when Stiles said that his dad was poisoned. Stiles thinks that the jump could mean surprise and wonders why Theo would be surprised that his dad is still dying. They realize that Theo never said that he attacked the Sheriff, which means it was probably someone else--another chimera. In his hospital bed, the Sheriff whispers the same word. Stiles gets into the car and locks the door to keep Scott out. Scott argues that Stiles doesn't know where to start, only that they're after a chimera. "Come on. Let me help. I can find the clues that you can't." Stiles starts to drive away, but Scott steps in front of the car. "You can't do this alone, okay. You need me. You need all of us. I can get more help. I can text Liam." Stiles deadpans. "Liam just tried to kill you." Scott again asks to help. Stiles replies, "You believed him?" Scott says, "You trusted him, too. Theo got to all of us." Stiles points out that Scott doesn't even know the true story about Donovan. "I don't need to. All that matters right now is your dad. Come on, Stiles. We survived an Alpha pack, a dark druid, professional assassins. We can survive Dread Doctors and chimeras, too." Stiles thinks about it for a second and then says that they're not looking for a missing chimera, they're looking for a missing teenager. Liam and Mason head to the library. The damage appears to be mostly smashed chairs. Liam looks around, remembering attacking Scott. Mason grabs a book which contains a map of telluric currents. They trace all the lines to a point where the ley lines converge, which should be the nemeton. Liam says that Stiles and Lydia weren't able to find the nemeton this way. It has to want to be found. Mason thinks that's awesome. He starts to suggest that they make a copy of the map, but Liam rips the page from the book. Mason is horrified and dumbfounded at the destruction of a library book. The hospital staff load Lydia into an ambulance to take her to Eichen House. "I'm going to find a way to get her out of there," Jordan tells Ms. Martin. "Even if I have to break through the walls." Dr. Fenris tells him good luck. After he gets into the front seat, it's revealed that Dr. Fenris is actually a glamoured Valack. He's been keeping up a veil. The orderly, Schrader says, "She's a pretty little thing, isn't she." Valack replies, "That pretty little thing could shatter your skull with her voice if someone decided to teach her how." They drive off, leaving Parrish at the hospital. Stiles and Scott are in Stiles's room. Stiles says there was a call a few hours ago about a missing sophomore named Noah Patrick. They head to the hih school, where they break into Noah's locker. Scott tosses a piece of Noah's clothing to Malia. "You called her?" Stiles asks, sounding betrayed. Scott says that they need all the help they can get. "I should be calling everyone." Malia adds that she knows what Noah looks like. Noah is running away from the Dread Doctors. He runs into an underground loading dock. Mason and Liam are in the woods looking for the nemeton. There should be a clearing, but they aren't seeing anything. "Maybe the clearing doesn't want to be found either?" Liam crouches down and looks ready to cry. "I couldn't save her." "No one could." Mason explains that he was standing right there while Melissa tried everything she could, "While I was trying to kill Scott." Mason tells him that he can't blame himself. "It wasn't just the moon." Mason tells him that Theo took advantage of his fear and anger. Liam suggests that maybe he's just a murderer, but Mason insists that there were extenuating circumstances. Mason stops mid-thought as he's looking around. "The nemeton's a beacon for supernatural creatures, right? So what if it takes a supernatural creature to find it?" Liam points out that he's a werewolf. "But you've been looking with your human eyes." Liam wolfs out and is able to see the nemeton between some trees. There are still bodies set around it. "Intense," Mason says. Malia tracks Noah to the loading dock. She and Scott break away from Stiles, and she asks, "He didn't want you to call me, did he?" "No. Is it that bad?" "We kind of broke up, I guess," she replies with a shrug. "Yeah, we kinda broke up too," Scott tells her. Malia starts to walk away, and Scott trails her. "You can tell me what's happening with you. I mean besides Stiles. You can talk to me." "I said I'd help find this kid and I'm doing it to save Stiles's dad. Don't ask me to talk." Scott rephrases that he was just letting her know that she could, if she wanted. Some wind blows through a grate, and Malia follows Noah's scent. In the hospital, Dr. Geyer pulls Melissa aside. "Melissa, that man in there is dying, and I don't know how to save him. I went to Harvard Med. I have degrees lining the wall of my office. And I don't have the slighest clue what's going on here. If you know something about this that I don't..." She's surprised. He says that nothing seems to faze her and it seems like she knows something. She tells him that she could relate a lot of really bizarre things, but nothing that would help him save Sheriff Stilinski. It's evening in the woods. There are four chimeras around the nemeton, which means that four are missing. Liam takes this to mean that Hayden is alive. Mason thinks they should tell the cops. Then, lights turn on behind them. Hayden has brought the sheriff's department. "That's it. That's where I found the bodies. Four of them." Liam is speechless. Malia finds a blood smear that matches Noah. Scott looks around and realizes that they've been in tunnels like these before, when they were looking for Liam and Hayden. Scott suspects that they are getting near the Dread Doctors' lair. Stiles doesn't care, since it won't help his dad. Noah comes out of nowhere and throws Stiles into a wall. He gets knocked out again. This time we see the full memory. His dad tells him he needs to get up from where he's kneeling next to his mom's coffin. Sheriff Stilinski puts his hand on Stiles's shoulder to comfort him. "You gotta get up now." Stiles reaches his hand up, and Scott takes it. Malia growls and slams Noah into the ground. Noah begs to be let go. "They're coming," he says. And then they hear the chittering of the Dread Doctors. Malia lets Noah go, and he starts to run but Stiles grabs him. Noah tells him that he doesn't remember what happens when he changes. "You clawed my dad half to death and now it's poisoning him. You're gonna start remembering every detail right now." Scott tells Stiles to take Noah to the hospital. Malia thinks Scott is crazy. "We're not gonna be able to stop them." "But we can slow them down." Stiles takes Noah and runs. Scott and Malia stand ready to face the Doctors. Scott's wound bleed through another shirt. Scott tells Malia that they're going to be okay. "Scott, we're gonna die down here," she replies. "No, we're not." "How can you be so sure?" "Because you're not the only one that I called." Chris Argent appears behind them and tells them to get down. He fires shots at the Doctors, but they use their magnetism powers to put up a shield to stop the bullets. Chris yells at the kids to run, and they do. Stiles and Noah encounter a locked gate. Noah tells Stiles to step back so he can break it down. Most of the time he loses control, though, so Stiles should stand clear. Noah grows a bone spike out of his arm and bursts opent he lock. Stiles spots a bloody, broken portion at the end of one of the spikes and knows what's poisoning his dad. Stiles calls Melissa, and Melissa runs to Dr. Geyer to tell him that they have to open the Sheriff up. Dr. Geyer doesn't want to. She tells him that it's a piece of bone and he's being poisoned by bone marrow. She tells him that she knows it doesn't make any sense but insists that he do it. They do, and they extract the piece of chimera bone. Scott, Malia, and Chris enter the hospital, and Melissa gives them a relieved look. Stiles is asleep at his dad's beside. The Sheriff wakes up and touches Stiles's arm. "It's okay Stiles. You still got me," he says. Stiles holds onto his hand. Theo takes Hayden into the loading dock. She tells him that Noah was there. He asks what else she knows, and she asks how she can know that. "Noah's part berserker. You're part jaguar. You'll be drawn to each other." She asks if that's why she there with him. "I saved your life," he tells her. Hayden gets a worried look on her face and tells Theo that Noah is dying. Noah is leaking mercury. He looks around the corner and sees the Dread Doctors. Theo and Hayden find a drop of mercury on the ground. "We coulda used him," Theo says, angry. They both look up and see a symbol carved into the wall. 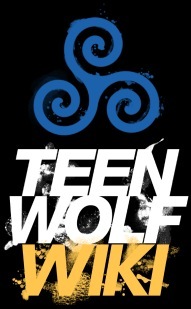 It's Scott's tattoo, the symbol of his pack. "It was more than a symbol, wasn't it?" Valack asks Lydia. "It was a promise to reunite them." Lydia says yes. Valack asks if Scott has done it yet and if he'll be coming for her. A bell buzzes. "Someone's coming, but it's not Scott." Theo and his pack arrive. Valack tells them that the Dread Doctors don't know how important Lydia is yet. Tracy grabs Valack and slams him into the wall. They walk in. Josh comments that she doesn't look good. Corey adds, "She has a hole in her head. That's not a good look for anyone." Theo looks troubled and gets a closer look. "I can't believe this is actually a medical establishment." He orders Josh to pick her up. Valack asks Theo what a pack of chimeras would want with a banshee. "I don't want a banshee. I'm looking for a hellhound." Someone roars, and they turn to look. Parrish is at the hall gate. He grips it and melts it. Valack turns to look at him. "You wanted a hellhound, I think you found one."